Some Reviews Just Speak for Themself…. “Experience New Growth and Transformation in Your Spiritual Walk. Are you experiencing a hunger to know God more completely in your life? Do you long for a deeper connection with him? If so, then the NIV Spiritual Renewal Bible—the recipient of the 1999 ECPA Gold Medallion Award—is for you. I don’t know if this makes sense, but this Bible arrived on a particularly difficult day here. When I opened the box that it arrived in, I just felt – peace. From the soothing artwork on the dust jacket to the feel of the book itself, it has been a joy to explore it. According to the authors of the devotionals, commentaries, and profiles – the purpose of this bible is to provide you with the steps to be transformed and renewed in your spiritual walk using seven keys/insights: to seek God and surrender to Him. To see the Truth, To Speak the Truth, to Grieve, Forgive and Let Go, to Transform your Life and Preserve your Spiritual Gains. 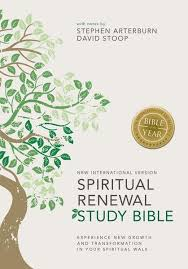 Other features include: Bible Book Introductions, Text Notes, Character Profiles, Spiritual Keys Devotional Reading Plan, Spiritual Disciples Devotionals and Spiritual Disciplines Profiles.